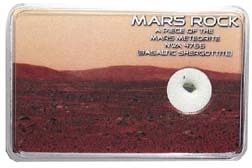 UFO books, space artifacts, models, DVD's, meteorite jewelry. More than 1/3 of Americans believe in UFO's and one in 10 Americans believe that they have seen a UFO according to a study by National Geographic Channel. UFO sightings are reported all over the planet by thousands of people. The real question is whether UFO's are interstellar vehicles visiting Earth? Most UFO sightings can be classified as misidentified aircraft, planets or other aerial phenomena, but certainly not all of them. There is that small percentage of UFO reports that can't be explained by any known aircraft or natural phenomena. And it is this small percentage of UFO sightings that create an exciting possibility. 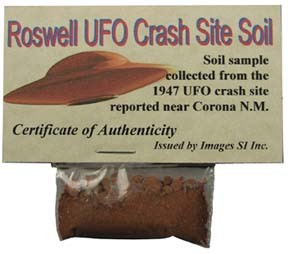 Red soil sample from the famous 1947 UFO crash site in Roswell New Mexico. Small plastic bag containing soil sample attached to a Certificate of Authenticity card from Images SI Inc. Though many meteorites have landed on earth only 34 have been identified as coming from Mars, making them extremely rare. Lunar Meteorites, originally discovered in Antartica in 1982, have been found all over the planet, but are more rare than diamonds. Own a piece of the cosmos today. Each Meteorite Sample ships in a plastic display case shown here. This ring is made of a mix of Iron and Nickel from the Meteorite Gibeon found in Namibia in 1836. The total known weight of the Meteorite was 26,000 kg. First documented by the early Spanish explorers in 1576 Campo del Cielo is aptly translated "Field of the Sky". The meteoritic iron was later used in making weapons for the war of independence from Spain. It is a polycrystalline, coarse octahedrite with silicate, graphite, and troilite inclusions of significant size. What really happened in Roswell New Mexico in 1947? Extraterrestrial Spacecraft that allegedly crashed at 11:59 on July 4 1947. This 1/42 scale model is based on drawings forensically composite by William Louis McDonald from interviews with witnesses and from the case files of authors Captain Kevin D. Randle, USAF Reserve, and Donald R. Schmitt. 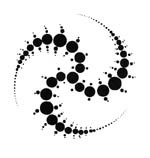 Crop Circle stickers are 4" x 4" in size. The background is transparent. The printed crop circle graphic is available in various colors. Peel away paper back reveals a strong adhesive that allows you to place the sticker on any variety of surfaces. Facts about the "Government Cover-up"
This book, co-authored by aviation/ science writer Don Berliner & Nuclear Physicist Stanton T. Friedman, offers an in depth look into the 1947 crash of flying saucers in New Mexico including the accounts of Dozens of witnesses and information gathered from recently de-classified documents about the crash.